Spinach Pasta Nests with Eggs served with a Simple Green Salad makes for a wonderful lunch or light dinner. 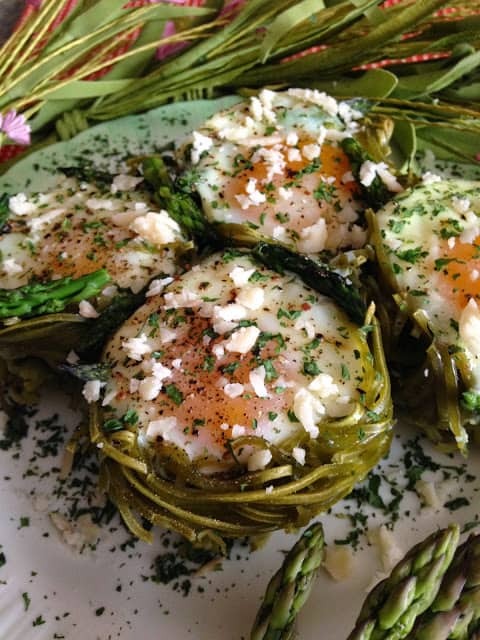 Pasta nests are perfect to serve for Easter brunch also. 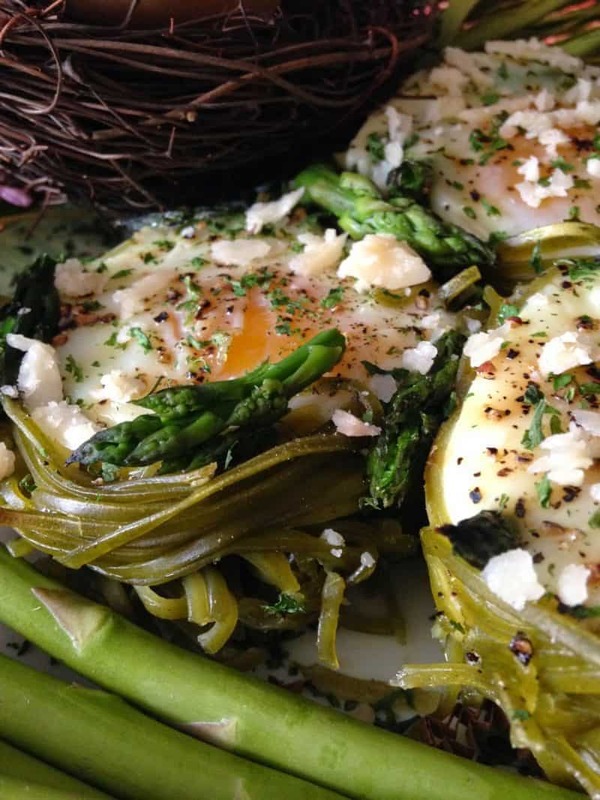 Taglierini ai spinaci or spinach pasta nests are filled with eggs, asparagus and a sprinkle of parmesan cheese. 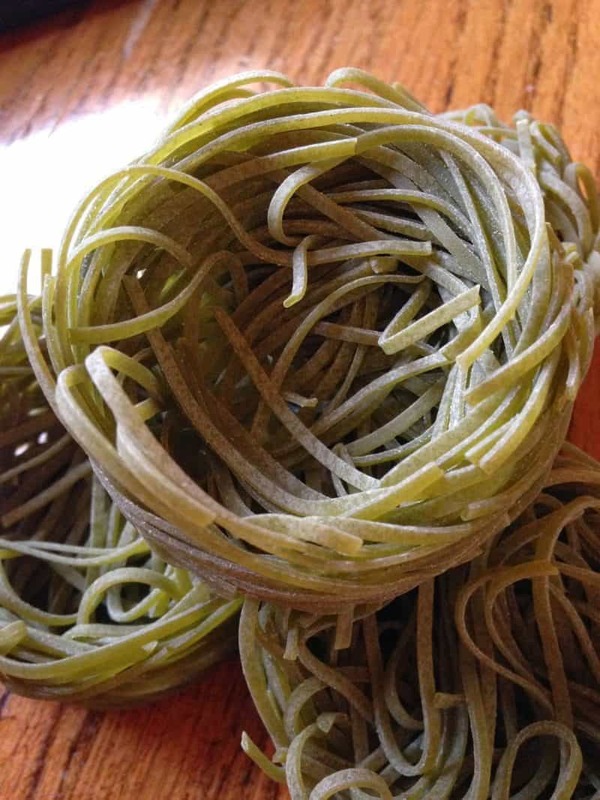 For this recipe we used packaged spinach nests that we purchased at Aldi, but you can certainly make your own nests. Making your own pasta nests is really simple to do. Purchase your favorite spinach flavored pasta, follow cooking directions on the package. Drain pasta and form into nests. Aldi had spinach (green), squash (yellow) and red (sweet pepper). Being the type of person that I am, I bought 2 of each color. Even though we purchased the spinach nests, the remaining ingredients are fresh. Fresh is always best, whenever possible. Living where I do, here in northern Wisconsin, I can get in my car, drive a couple of miles down the road, and pick up farm fresh eggs, and fresh picked asparagus. A quick stop at G.G’s Cheese Mart for some fresh parmesan cheese and home I go, to make this super recipe. Preheat oven to 350º Lightly butter standard size muffin/cupcake tin. Fill a large pasta pot with 8 cups water and add 1 tablespoon salt. Bring water to a boil. Add pasta nests and boil gently for 6 to 7 minutes or just until al dente’. Turn water down to simmer. Drain; place pasta shells in buttered muffin cups. Using your fingers, create a small well in the center by pushing the pasta to the outside edges. Don’t worry if its not perfect, you just want to make a well to hold the egg. Wash asparagus and pat dry with a paper towel. Snap off the tips of the asparagus spears. Save the stalks for another use. Add asparagus tips to simmering water; blanch tips for 30 to 40 seconds. Remove tips from water with a slotted spoon. Immediately immerse in ice water. Leave in ice water for 20 seconds. Remove from ice water and drain. 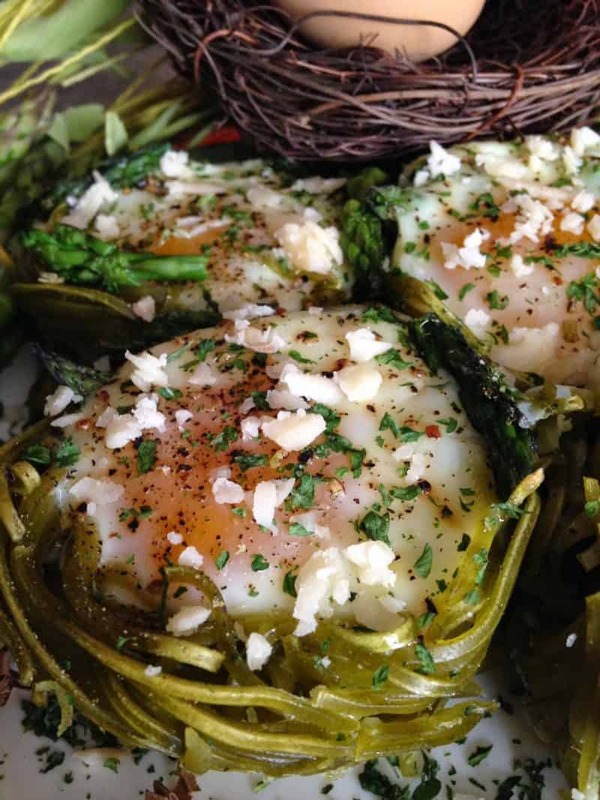 Place 3 to 4 asparagus spears in pasta nests. Crack your eggs into the well/center of each nest. 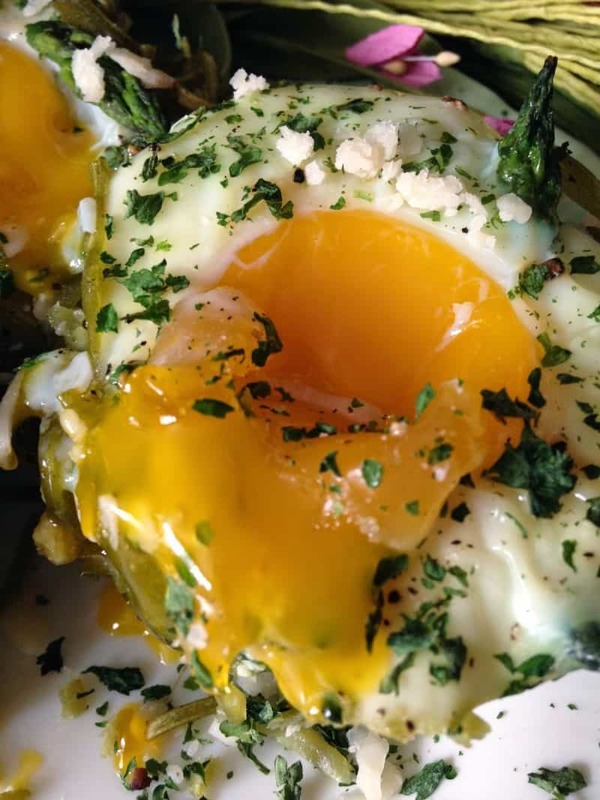 Sprinkle eggs with salt, pepper and parsley flakes. 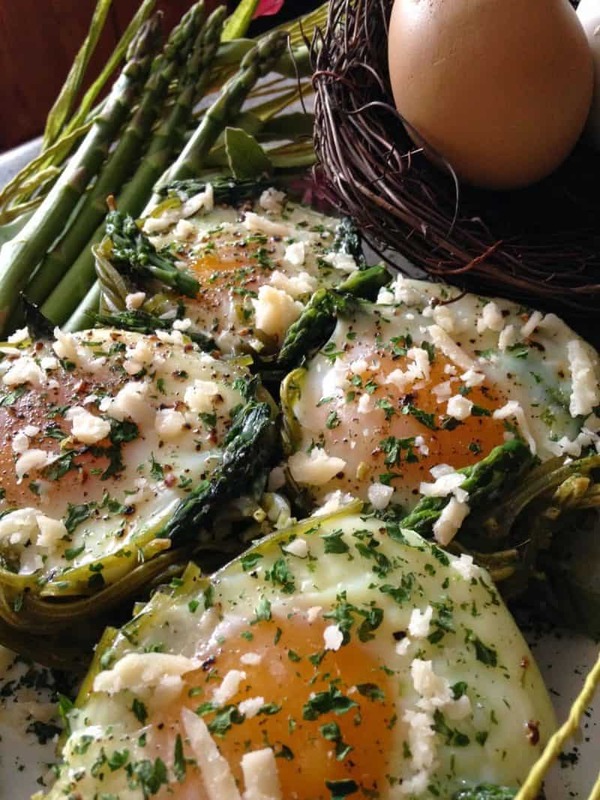 Bake for 25 to 35 minutes or until eggs are set with no uncooked whites surrounding the yolks. Remove pan from oven, carefully remove nests. Garnish nests with fresh grated Parmesan cheese. 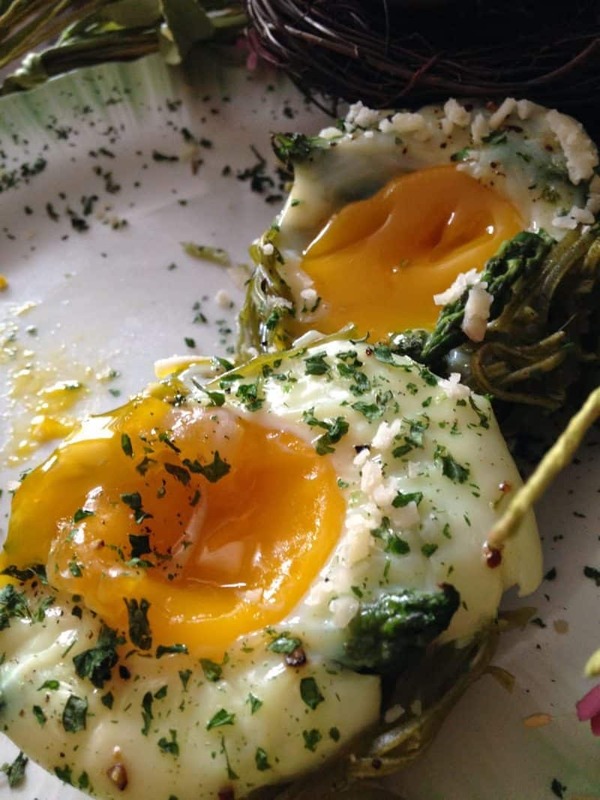 Bacon Egg Cups and Tavern Style Pickled Eggs are two egg recipes you’ll want to try. Health Note~ Hidden under the fuzzy skin of a kiwifruit lies beautiful, brilliant green flesh with edible black seeds. Choose plump undamaged kiwifruit that yield to slight pressure when ripe. 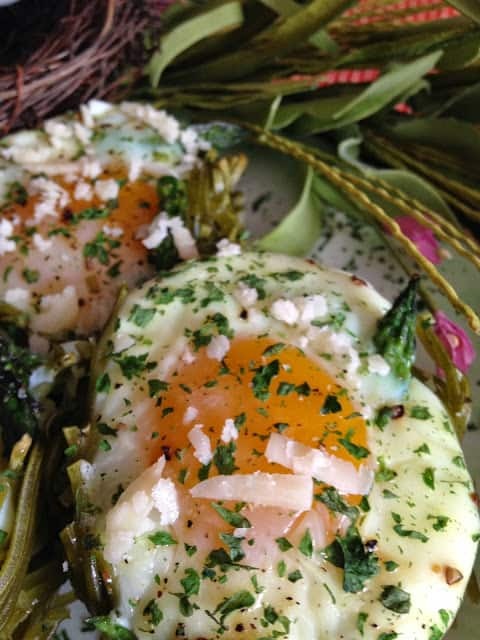 These nests are perfect for spring. Nice job, Lynn! Thank you for sharing. This looks delicious Lynn, I would love to make this for Mother's Day brunch. Thanks for sharing with Foodie Friends Friday this week. Look forward to seeing you again soon. Pinned/shared. What a super cute idea! Thanks for sharing at Simple Supper Tuesday. What a beautiful and healthy recipe! Thanks for sharing at the "From The Farm Blog Hop".